According to the legend, Lord Samudrarajan (King of the Ocean) was longing for a child and his desire was that Goddess Mahalakshmi should be born as his daughter. He prayed to her for many years after which the Goddess appeared before him and granted his wish. One day, he found a beautiful girl child in the middle of a lotus flower in the ocean. Thanking the Goddess Lakshmi he exclaimed " Ennai Petra Thaaye" (Mother who gave birth to me ) naming the child as Ennai Petra Thaayar. The little girl grew up into a beautiful young lady and it was time to get her married. But Samudrarajan was not willing to part with his daughter whom he had got after praying for so many years and so when Lord Narayanan came asking for her hand in marriage, he laid a condition that he should stay with them in their house for which the Lord agreed. The seven feet Bhaktavatsala perumal in Kalyana Thirukolam (wedding attire), and with the words " Maam Ekam Charanam Vraja" (Take refuge in me alone) written on his right hand (only other place you can see this is in the hand of Uppiliappan in Kumbakonam), is a scintillating sight to watch. 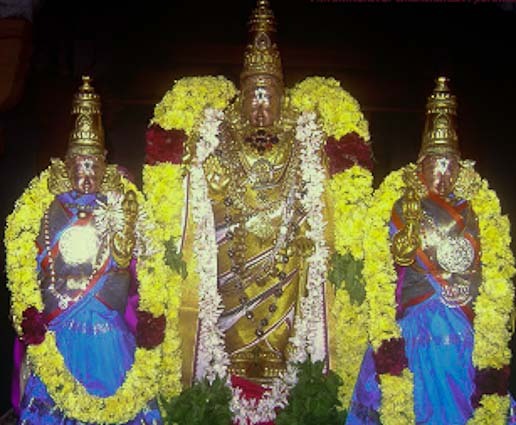 In front of the moolavar is the utsavar (procession deity) called Patharaavi and is accompanied by two consorts Sridevi and Bhoodevi.There is a separate sannidhi for Ennai Petra Thayar also called Sudhavalli. The temple also has separate sannidhis for Andal, Chakkarathazhwar, the Alwars and Sri Ramanuja. The temple was built during the Pallava era, and is estimated to be 1500 years old. The temple has a 5 tier gopuram at the entrance. There is a separate sannidhi for Ennai Petra Thayar also called Sudhavalli, the consort of Lord Bakthavasala. On the banks of a lake a few meters behind this temple is another temple for Lord Rama. In this temple there is a beautiful statue of Hanuman lifting Rama and Lakshmana on his shoulders. The temple is administered by the Hindu Religious and Charitable Endowments department of Tamil Nadu government. H.H Pedda Jeeyar of Tirupathi is the permanent trustee of the temple. When Tirumangai Alwar came to Tiruninravur he did not sing any paasuram about Bhakthavatsala peruma here in this place. As per the legend ,when Thirumangai Alwar came here to get the darshan of the Perumal, Lord didnt notice him, as He was talking with Periya Pirattiyaar. Annoyed at being ignored, Thirumangai Alwar just worshipped him without doing Mangalasasanam. He then went to Tirukkadalmallai (Mamallapuram) to worship Sthalasayana Perumal. Bhakthavatsala, anxious for his devotee to sing about him, followed him and appeared to the Azhwar in Tirukkadalmallai as Bhakthavatsala Perumal and it is there that the pasuram about Tiruninravur was sung. Lakshmi PoojaAs the name suggests, this is the temple for wealth, prosperity and all the wealth in the world. There is a nine squared matrix drawn in front of the Ennai Petra Thaayar Sannathi as shown in the picture, which has specific numbers. By repicating this matrix in your pooja room and placing one rupee coins ( or any coins such as quarters if you are out of India) on each of the squares, and praying for nine days, it is proven that once prayers and wishes are granted. The pooja can be performed by drawing the Yantra in the pooja room on a flat surface using white kolam powder or with the card that is sold in the temple. Pooja should be done for nine days by placing one rupee coins ( any coins of same denominations) in each of the boxes, applying sandal paste,Kumkum and flowers on the the matrix and reciting the Lakshmi ashtotram. The coins of the previous day are then removed and stored safely and new set of coins are used the next day. After completing nine days of pooja the 81 coins along with thambulam for nine sumangalis are taken to the temple. The temple priest places the coins at the Thaayaar's feet and performs archana. The first Thambulam is then offerred to the Goddess. After that, he gives the coins back to the devotee who then deposits the coins in the Hundi outside the shrine. The remaining thambulams are given to other women in the temple. It is preferrable to start the pooja on Friday. If the Friday happens to be a Full moon day, it still more auspicious. Temple locationThiru Nindravur,( Chennai suburb) Tiruvellore District. How to reach? Going along the Poonamalli High road from Chennai take right turn towards Thiruvallur. It is around 4 kms on that road. Alternatively you can also take MTH road leading to Chennai - Tirutani highway. There is a flyover connecting towards the temple as you approach the Tiruninravur town. All fast and normal EMU trains bound to Arakonam, Thiruvallur, Tirutani starting from Chennai Central and Chennai Beach halt at Thirunindravur railway station. Where to Stay? There are no hotels here. The best place to stay is in Chennai. Other interesting places around Tiruninravur Hridayaleeswarar Temple dating back to the 6th century is nearby. As also the temple of Eri Katha Ramar is very nearby.